Ruth Falk Burkholder took her first golf lesson over 50 years ago at Riceland Golf Club. She rented clubs and paid greens fees of fifty cents each at the gas station on the north side of U.S 30 across from the golf course. Her teacher was Belmont Rice. She took one other lesson from Vince Smith of the Wooster Country Club. Since then she has become one of the premier golfers in the area and has taught many young people the game. Although golf remains her first love, which she still plays daily here in Wayne County and at her winter home in Florida. Ruth has also excelled in other sports. When she was a teenager, fastpitch softball was a very popular sport of the day. At age 14, she was selected to play on the First National Bank team. Ed Seas was the sponsor and he had come to Ruth’s house to give her sister a tryout for the team. While he was there, Ruth impressed him so much that she made the team. She played on this team from nine years. During her playing career, many league and tournament championships were won by this team. They beat some of the best teams in Orrville and Wayne, Stark, and Summit Counties. She pitched three no-hit, shut-outs to help the team accomplish this outstanding record. Also during this time she met and married her first husband, Franklin Falk, who was the team’s scorekeeper and statistician. Burkholder has won 25 golf league championships in the Orrville area. Eighteen of these were won in the Riceland Women’s Golf League. She is a charter member of this league and is the only original member still playing each year. Seven additional league championships have been won at Julie-Fe View County Club. She has made three holes-in-one (or Aces); one each at Riceland, Julie-Fe, and Beacon Woods (in Florida). One of the most difficult tournament victories won by Burkholder was the Babcock and Wilcox Champion of Champions. In this match, all handicap strokes must be given by the various flight champions to each of the others. Ruth was playing a scratch (0 handicap) and beat all the others to win. She also won the Wayne-Stark-Summit Polio fund-raising tournament the year it was held. In all the time that she has played golf, which now spans over fifty years, Ruth has carried a handicap of 17 or less, playing at zero for at least five years. At the club where she plays in Florida, there are 207 women in her league. Ten of these have handicaps of less than 20 and hers is the lowest of them all. They have tee times from 6:30 a.m. to 4:00 p.m., seven minutes apart, and reservations are usually booked at least three days in advance. As much as she likes to play the game of golf, Ruth always found time to teach it as well. She has taught at Riceland of course, but also at the Wooster YM/WCA, and is currently teaching in Florida during the winter months. She tells an interesting story about teaching twin boys. One was left-handed, the other right-handed and their father only bought one set of clubs for them to use. Both learned to play right-handed and quite well. Burkholder’s husband, Franklin, passed away several years ago and she has since married Virgil Burkholder. 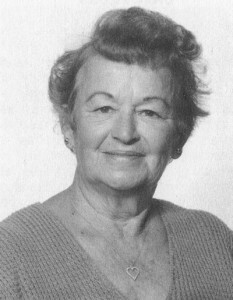 She has two children; Nancy Knight, and Franklin Todd (Butch) Falk; and four grandsons.